The Emirates airline has announced an order for up to 36 Airbus A380s. 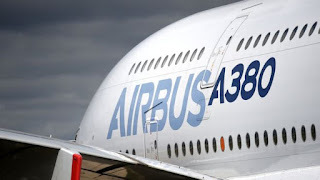 The $16bn (£11.5bn) deal amounts to a reprieve for the A380 after Airbus threatened to stop making the jet if it could not come to a deal with Emirates. Emirates is the only airline to have put the A380 at the heart of its operations and had been expected to place an order for more of the jets at the Dubai Airshow last November. However, it then ordered 40 Boeing 787 Dreamliners instead. Emirates said it had now made a firm order for 20 of the A380, the world's largest passenger airliner, with options to buy a further 16. Deliveries are scheduled to begin in 2020. Emirates is already the largest customer for the plane, with 101 currently flying and 41 more firm orders previously placed.